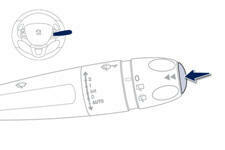 Press the button on the end of the wiper control stalk to display the various tabs in succession. ● the current fuel consumption, ● the Stop & Start time counter. - Trip "1" with: ● the average speed. ● the average fuel consumption, ● the distance travelled, for the first trip. ● the average speed, ● the average fuel consumption, ● the distance travelled, for the second trip.